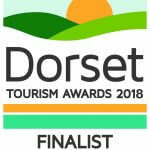 chosen as a finalist in the 2018 Dorset Tourism Awards. We’ve never entered any awards before now and have been selected as one of the top three in the Glamping and Alternative Accommodation category across the whole of beautiful Dorset. This means we will be given either a gold, silver or bronze (to be announced in November). We feel so humble to get such an acknowledgement doing something we so enjoy.